Find a wide choice of available racing yachts at a glance - easy and fast. Top Marine Brands! Up to 30% discount with your next charter! Sorry, no Charter Offer yet. Fun and easy to sail racer cruiser with asymmetric spinnakers. This Farr designed race yacht sails with up to 18. Very fast 46 racer, built 2007 in NZ, simple and fast boat, well designed racer cruiser. Yacht is available for all races in Asia. The First 40.7 combines a sleek and sophisticated racer with all comforts of a luxurious cruiser. This Beneteau 47.7 is a beautifully appointed yacht, well maintained and raced competitively in major regattas and offshore events in Europe and the Caribbean. Popular racer / cruiser from J-Boats with asymmetric spinnaker. Successful racer / cruiser from J-Boats with asymmetric spinnaker. New racer / cruiser from J-Boats with asymmetric spinnaker. Prima 38 racing yacht with a carbon fibre mast ,carbon spinnaker pole and kevlar sails. The Prima 38 is renowned for her speed and grace. The Pronavia 38 is a fantastic performers under race conditions, based on a recognised high performance IRC yacht design. 38 ft racer / cruiser derived from a Reflex 38. 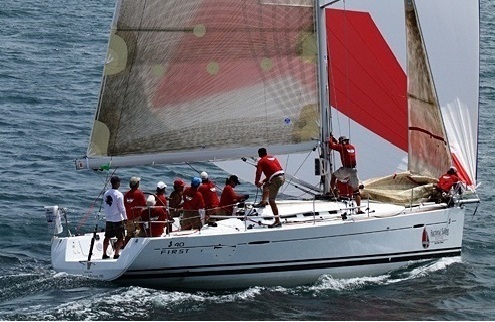 A fantastic hi-performance race yacht that sails to her handicap. Beautiful Swan 51 in excellent conditions and professionally maintained to the very highest standard. Ultra fast TP52 Carbon Racer - FOR CHARTER AND FOR SALE! Built for Grant Dalton's Volvo Ocean Race 2001/02 campaign. Since then she's been always kept in excellent shape and participated in most offshore/inshore races in Europe and Caribbean. This racing boat, a 92-foot Super Maxi, is designed to win the most prestigous regattas in the world and break sailing records. Steinlager II: Whitbread winning maxi ketch one off. The X 35 OD is not only a racing yacht, but also very capable for cruising purpose. * Day changes are also possible ** Prices of offers may vary due to exchange rates. All prices apply in original currency.